SyFonOne is a tool for playing midi in real time from a midi input port. Connect SyFonOne to your keyboard port or to a virtual midi relay port like loopMIDI by Tobias Erichsen (tested on Windows 10) (other alternatives are: MIDI Yoke and LoopBe1). Choose the virtual midi relay port as the output port in your midi player. See image below for how to use loopMIDI with VanBasco. For lowest output latency output you may want to use ASIO. I recommend the free ASIO4ALL. Set the buffer size to 1024. See image for Setup details. - Just fixed a number of reported bugs. - New algorithm for the internal reverb, with five presets, which cannot be edited. - You can now define a set of folders where you keep SoundFont banks. These will be search for a suitable preset if not found in the default SoundFont. - Fixed a few reported bugs. - Faster and leaner synth engine. - Fixed a bug introduced in 1.053: crash when putting the engine to sleep. What's new in version 1.052? - Fixed a few other minor bugs. What's new in version 1.051? What's new in version 1.050? - Compiled in a newer Delphi environment. Due to this many user interface items have changed. Here is a in-depth description of SyFonOne. This is a "syphon". A syphon is a device that can transfer liquid from one place to another. 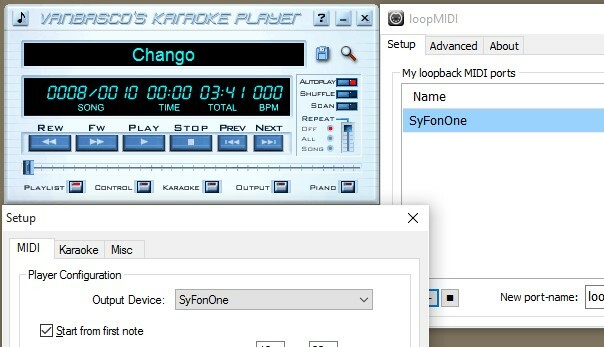 To use SyFonOne as a playback engine as a MIDI Output Device for MIDI payers like VanBasco's Karaoke player you simply need to install some kind of MIDI loopback program, like loopMIDI.